What could be nicer - mini spa/pamper day with Prosecco and cake! 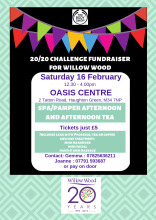 As part of the 20/20 Challenge for Willow Wood, Body Shop consultants Gemma and Joanne have organised a Spa/Pamper Afternoon complete with Afternoon Tea. Tickets are just £5, and that includes either a mini makeover, mini facial or a hand and arm massage, plus cake with your choice of tea, coffee or Prosecco. Further treatments can be purchased on the day. Held at the Oasis Centre, 2 Tatton Road, Haughton Green, M34 7NP tickets can be purchased in advance from Gemma on 07825 636211 or Joanne on 07791 593687. Alternatively just pay on the door. It starts at 12.30pm on Saturday 16 February until 4pm, and should be a lovely day.